Unlike science in middle school, high school biology is hands on. 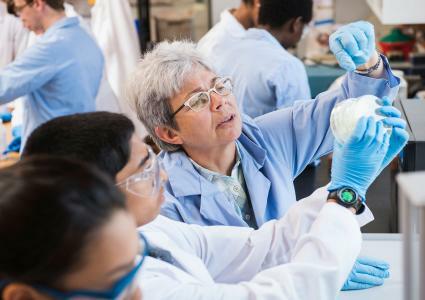 Experiments are a common part of biology courses, whether they be a part of a controlled laboratory class, science fair or a part of individual student projects. This experiment is great because it is cheap, easy and you can do it in a variety of areas around your school or send students home with it. The goal is to observe the area around you over time, and observe samples that you collect. Take note that you will be observing your area for several months, so choose an area that is easy to re-mark, or where you can leave the markings up so you return to the same designated area each time. Have students choose one spot to observe. The spot should be no more than two to three feet square. What fungus do you see? (Look for mushrooms and other fungal growth. Guide students to make connections and note relationships in their marked area. Have them inventory the area, and draw a crude map of where everything is. If possible, have students use tweezers and gently take samples of soil, fungus, moss, plant life, insects, etc. Require students to record everything in their own journal or interactive notebook. Teacher tip: Set up stations in the classroom for viewing, dissecting, drawing, testing pH, etc. This will allow students some choice in how they proceed with examining their specimens. Have students see where the most bacteria is lurking. This experiment is great if you want a lab that has guaranteed results. There is always some kind of bacteria lurking somewhere just waiting to grow ripe on student's Petri dish. Material notes: You can also purchase sterile Petri dishes and agar separately, however, it is much more likely students will contaminate the plate before they swab. Before opening any materials, have students identify three places (but in one physical location such as at home or at school) that they are going to swab for bacteria. Encourage them to hypothesize about which place they think will grow the most bacteria. Using the Petri dish, trace three circles on the graph paper and cut it out. In pencil, draw a line to denote the 'top' of the circle. It doesn't matter where you draw the line, but you will need something to show you how your Petri dish is oriented so you can be sure you're tracking the same colony each time you observe. One the back of the graph paper circle, note the location where you will take the swab, as well as the date you are taking the swabs. Do this for all three Petri dishes you have. Set the Petri dish down on a flat surface. Swip the swab across the area they suspect has bacteria. Lift the lid, gently swipe the used swab across the agar, and close the lid, carefully but quickly. Hint: Sometimes it's helpful to tape the Petri dish shut so that the Petri dish doesn't accidentally lose its lid. Have students draw Petri-dish-sized circles in their lab books or on separate graph paper. Draw one week's worth of Petri dishes for each dish the student has. As the colonies start to grow, have students draw the size in their notebooks, making daily observations. If they cannot observe daily, have them observe on the same day(s) over a month. They should also be recording color and other notable features of their bacteria colonies in their lab books. In this lab, students investigate how light affects plant growth. Students may use any plants, but cress will grow more quickly so your students can get results faster. On Day 1 - plant seeds in soil in the cups. Label the cups according to the light you're going to use. You can compare sunlight vs completely dark or you can compare several different types of light. On each day after the initial day, take a picture of each cup and try to measure the growth if any. For your lab entries, measure the sprouts, and note color and shape characteristics. In this lab, students watch the rate at which planaria regenerate and test whether or not how you cut the planeria makes a difference as to how they grow back. Start by numbering the three smalle Petri dishes to ensure nothing gets confused later. Using the pipet, move a planarium into the large Petri dish. At this point, you may want to try to set the Petri dish on an ice pack for a few minutes. This isn't totally necessary, but it will slow the Planarium down to make it easier to cut. Use the pipet to gently transfer each segment to a new Petri dish (with spring water). Repeat the steps with all remaining worm segments. 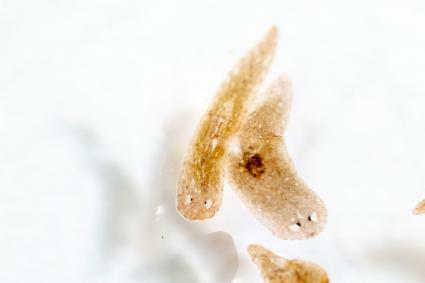 Every day, observe the planaria. Regeneration will be considered 'complete' when the photoreceptors (the black dots that look like eyes on the planarium's head) appear. 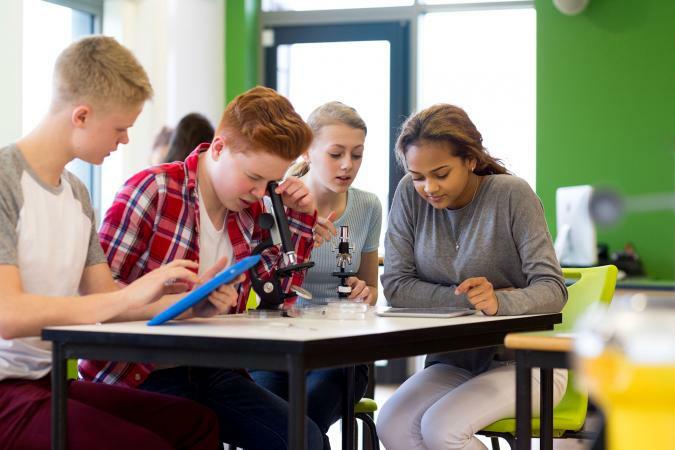 Whether you are looking for a science fair project or need to create a project for a class assignment, there are numerous biology projects for teens to get their hands in. 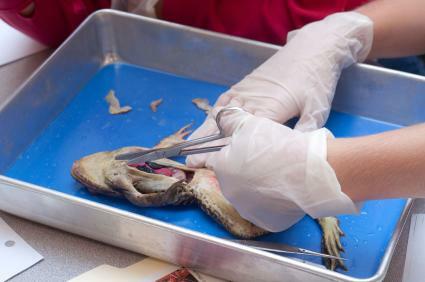 Frog Dissection: Dissecting a frog is a quintessential part of high school biology. If possible, try to get female and male specimens for your class so students can see the eggs and compare the insides to the male frog. Diversity among plant samples: Another simple biology experiments involves going into your natural environment, such as a local park, to observe diversity among plant samples. To make the experiment more detailed, students can rub collected samples on filter paper to observe which plants present which colors. Teens can work to find out why certain plants present certain colors. Water from common sources: Water is everywhere. Unfortunately, water contains numerous elements too. A great experiment is collecting water samples from a wide variety of sources and viewing them under a microscope. Students can then compare their results and attempt to postulate why a given water source would present more organisms than another would. Yeast: Another experiment involves taking a piece of bread to monitor the molds that grow over a period of two weeks. 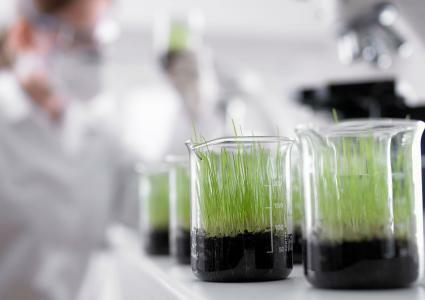 Pea Plant Genetics: Students can recreate Mendel's genetic pea plant experiments. By growing pea plants and comparing their phenotypes, students can figure out what each parent plant's genotype is. Comparing Animal and Plant Cells: To better understand animal and plant cells, students can compare cells from their cheeks to cells from an onion. Just stain the cells with iodine or another dye to better see the cell structures under a microscope. DNA Models: Creating a DNA model is a great way to help students understand the structure and function of DNA in genetics. Students can use candy, string and toothpicks to come up with a fairly realistic model of the double helix structure. As much fun as biology experiments can be, there is an educational component spearheading the experiment. For teens, high school biology can be fun. Finding the right experiment can help biology pop off the page and become more than just another required course of study. Who knows? Perhaps your student will even be prompted to enter a science fair?